When it was first presented back in 2013, we could hardly believe our eyes. Not only is this concept one of the boldest presented across Europe, but it was also presented in a city with very limited funds, estimated at extremely low €100 million. Now these renderings are sure to be outdated, because the project's budget has been halved, while planned capacity fell from 40,000 to 30,000. 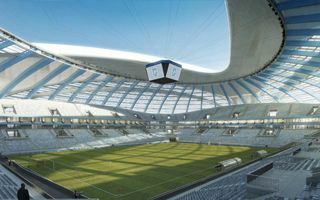 The updated football stadium should start growing in October 2014 and opening should take place just two years later, in October 2016. Demolition of the current Ion Oblemenco stadium will begin in August. As the old structure gives way, Craiova will lose its main athletic stadium. And with the 30,000-seater only holding football, the need for an athletic stadium also arose. Now the plan is to build a much smaller athletic facility for under 5,000 people in the vicinity. It's expected to be ready before the football stadium.